The USB Implementers Forum backed by Apple announced a new interface standard for braille displays, which will simplify development and bring down costs for the blind dramatically. The new standard should allow braille displays to work across a variety of platforms and devices, and drop the need for them to have custom software and drivers which keep the prices high. "We're proud to advance this new USB-IF standard because we believe in improving the experience for all people who rely on braille displays to use their Apple products or any other device," said Sarah Herrlinger, Apple's director of Global Accessibility Policy and Initiatives. Braille displays raise and lower a series of dots to present text, and can also represent cursors through means like vibration. Until now though they've had no consistent standard, and partly because of this have been prohibitively expensive, despite the dependence of many people on computers and the internet. 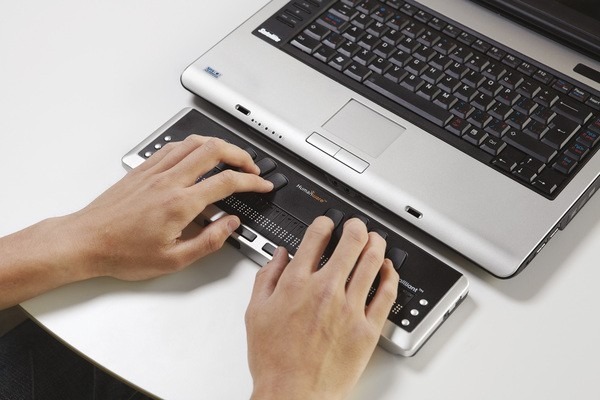 Handy Tech's Active Braille display, for example, is $6,495, but even less expensive peripherals by the likes of Humanware are often well over $2,000 and can approach $7000, oftentimes more expensive than the computer that they are associated with. That technology is likely to become an increasingly hard sell as AI voice assistants like Apple's Siri become more powerful and handle tasks without a screen or even a keyboard. Apple has long supported blind users through technologies like VoiceOver, which in fact offers plug-and-play compatibility for over 100 braille displays. Macs can run multiple displays simultaneously. The company recently switched the focus of its website to promote its efforts in device accessibility on Global Accessibility Awareness Day.